Clark Hulings loved Mexico. His body of work set there spans over 40 years. In what is now a well-known Hulings story, in 1963, the director of Grand Central Galleries in New York told him there was no market for paintings of laundry, cathedrals, donkeys, or Mexico in general. Fate intervened, and during that conversation, a customer bought one of his Mexican works with all of those elements featured. It’s an interesting story on a few fronts: for one thing, it’s a good reminder that artists should lead the way for tastemakers. While it makes sense to be aware of the market as it currently exists, artists are also in a position to forecast and influence it. 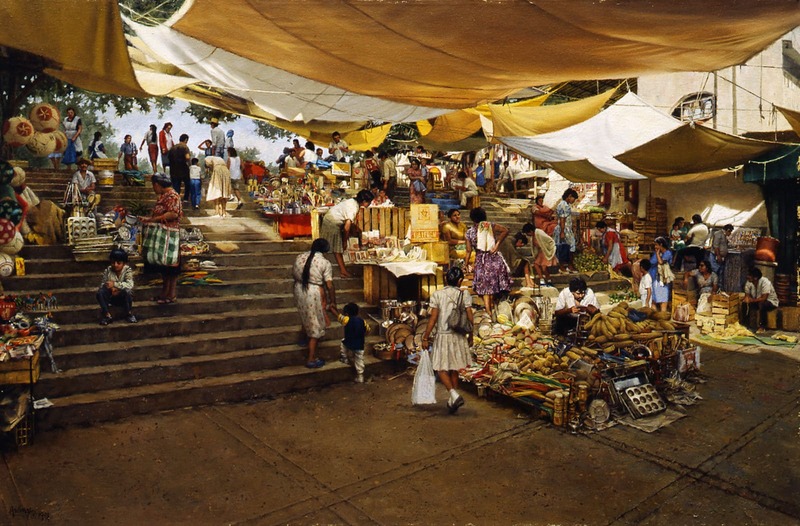 Speaking of markets, 1991’s Cuernavaca Steps—Hardware Market is a classic Hulings market painting. Fans of his work might think to compare it to Kaleidoscope for its complex design of multiple human figures in a Mexican market, and the bold yellow color of the tarpaulins. This one is an especially fascinating study because of its downward slope and the almost impossible amount of activity and detail Hulings has managed to pack into the descending stairs. It’s a testament to his skill as a painter that he has managed to create a completely three-dimensional experience for the viewer in a two-dimensional medium. He’s left us some visual breathing space in the foreground with the geometric pattern on the ground, but the rest is all action, layed-out on a diagonal from top-left to bottom-right. You’ll see muffin tins at several stalls, an assortment of pots and pans, and even some produce, such as plantains and limes. Hulings has made a point of showing the roping for the tarps, which is just one of the ways the hard work that has taken place in order to make this market happen becomes visible to us. Vendors are tending their stalls, shoppers are examining the wares, and a mother helps her little boy in a blue sweater summit the first step. Cuernavaca is south of Mexico City and the capital of the state of Morelos. It’s sort of the Hamptons of the area—it’s still a popular out-of-town getaway for city folks, which it apparently has been since Aztec emperors started summering there to enjoy its pleasant climate and bougainvillea. The area has a complex history, some of which is documented in famed muralist Diego Rivera’s commissioned piece History of Morelos, Conquest and Revolution at the Palacio de Cortes. Malcolm Lowery’s novel Under the Volcano was set in Cuernavaca, and the movie version was also filmed there. For jazz fans, this city was where bassist Charles Mingus spent his final days. We are delighted to invite you to visit us on a new page on the Clark Hulings Estate website: for a tour of his work in Mexico, please join us in English or en español to celebrate the traditions and hard work of our neighbors.